Viewing Area: 20 x 28"
The EVS-2028/FS/2F Executive Viewing Station with Floor Stand and Two Shallow Drawers from GTI provides users with a 20 x 28" viewing area with a luminaire positioned parallel to the surface and floor for color correct viewing as well as a built-in print bar for attaching prints quickly. This model is designed to sit on the floor and utilizes Graphiclite T8 fluorescent lamps with a D50 light quality rated at about 5000K. The luminaire also features an asymmetrical lens design that directs light at an angle for even illumination on the work surface and wall. 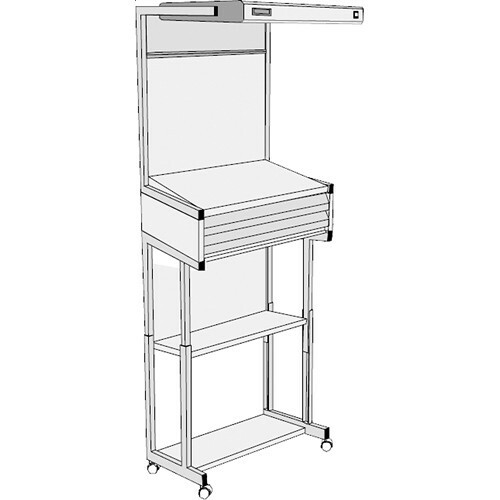 It comes with a metal table top, an adjustable height floor stand with shelf, and two 2" deep drawers. Additionally, this unit comes with a LiteGuard II viewing system monitor which will display lamp hours used and lamp hours remaining for your station. It will also show lamp warm-up times, out of tolerance information, and where to obtain replacement lamps.